Dion McKinley celebrates after a play against the Cincinnati Gators. Isaiah Lisath tries to get the sideline involved after making a leaping catch against the Cincinnati Gators. Coming back from a 23-point deficit to win a game is one thing. Making up said deficit — in just one quarter? That’s completely different. 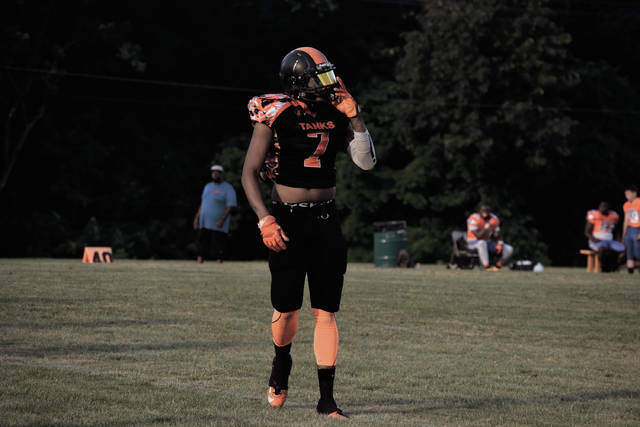 However, that’s exactly what the West Portsmouth Tanks’ football program did in a Saturday evening contest against the Columbus Gladiators’ football program. Needing a victory to tie the Gladiators for first place in the Blue Collar Football League’s East Division Standings, West Portsmouth — after trailing 30-7 following a fumble that was converted into a short four-play, 20-yard touchdown drive — rallied in a big way. Two touchdown runs by JoJo Buford in his first game as a West Portsmouth Tank, along with 96 yards rushing on 12 carries from Markel Cain and two critical defensive touchdowns — including a 60-yard interception return for a touchdown by Cedric Legette on the last play of the first half and a 64-yard scoop-and-score by Darion Robinson with just over 10 minutes left to play in the third quarter of action — allowed the Tanks to score 46 of the game’s final 52 points in a 53-36 victory over the Gladiators on the campus of the now-defunct Columbus Brookhaven High School complex in Columbus. If one were to ask Jamie Rice, however, the Tanks simply executed as expected — which made the comeback all the more surprising. Other than an 18-yard touchdown pass from Portsmouth native Duke Edwards to West Sider Dylan Koons with 7:27 to play in the opening quarter of action, very little went right for the Tanks in the opening quarter and in the first minute of the second frame as four turnovers within the first 16 minutes of action resulted in a five-yard scoop-and-score by Columbus, a short field that led to another touchdown, and two additional drives that consisted of 66 and 75 yards respectively as the Gladiators took a 30-7 cushion with 14:55 to play in the opening half. Seemingly unphased by the early barrage of points, the Tanks, behind an effective offensive line surge, obtained excellent production from Buford and Cain. Just over two minutes after the Gladiators’ final touchdown of the first half, Buford answered by capping off a five-play, 58-yard drive with his 11-yard romp to the house, and less than six minutes later, Cain’s 15-yard scamper, which capped off an eight-play, 48-yard drive, put West Portsmouth within 30-23 with 6:58 to play in the opening half of action. Duke Edwards’ two-point conversion runs on both occasions, along with an eight-yard tote that came less than a minute-and-a-half after Cain’s touchdown spurt, helped set the Tanks up for a strong finish to the opening half of play as Columbus’ once-sizeable 23-point cushion was cut all the way down to a single point (30-29). Even with the scoring barrage that it had already displayed in the quarter, West Portsmouth still wasn’t done. With the ball and a slim one-point lead at its disposal, Columbus attempted a hail mary to end the half in an attempt to extend its lead. The risky plan, however, backfired dearly as the explosiveness of Cedric Legette took over. The Wilson, S.C. native picked off a pass and took the interception the distance as his 60-yard touchdown not only kept the Gladiators from extending their lead, but allowed the Tanks to take the point away all in one fell swoop as West Portsmouth — following a successful two-point conversion from Edwards to Julian Lowe — took a 37-30 lead into the halftime locker room. Legette ultimately finished with seven tackles, two interceptions, two pass deflections, and the interception return for a score. In the second half, the West Portsmouth defense continued to roll in a big way, which was proven when Portsmouth native Darion Robinson picked up a loose ball and returned the pigskin all the way to the end zone for a 64-yard touchdown to increase the lead to a 45-30 margin with 10:07 to play in the third quarter. A blown coverage assignment allowed the Gladiators to close within 45-36, but the Tanks locked down defensively from there, and Buford — who combined with Cain to rush for 121 yards on 15 carries — scored on a three-yard touchdown run with 12:50 left in the contest to put the game away for good. Eleven tackles each by Charles Johnson and Richard Elery, along with nine from Dale Swords and eight stops apiece from Dion McKinley and Justin Staggs, were also critical in the winning outcome as West Portsmouth moved to 4-1 on the year with the victory while dropping the previously undefeated Gladiators to 4-1, as well — avenging a 32-26 loss in doing so. 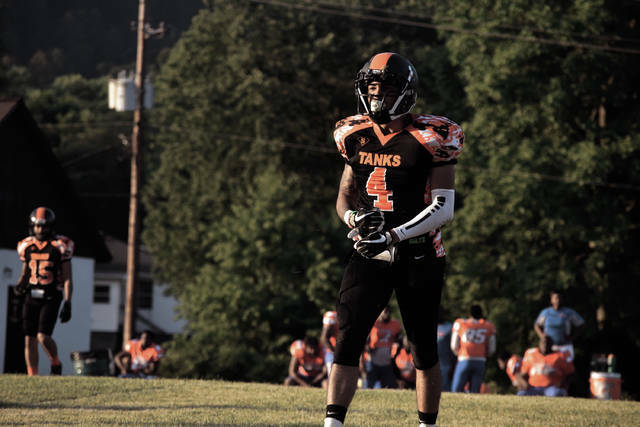 With the victory, the Tanks will turn their attention to the West Virginia Lighting (0-5), who the Tanks will play on Saturday evening at The Complex in West Portsmouth. The Marion County Crusaders (5-0) follow the next Saturday, and like the affair against the Lightning, will be held at The Complex at 5 p.m.